A highlight of my trip to Borneo was undoubtedly the two weeks that I spent at Gunung Mulu National Park in Sarawak. The 529 sq km park is named after Gunung Mulu, a 2,376 m high limestone pinnacle, which overlooks a fascinating area full of natural wonders including cave systems of mind-boggling proportions, spectacular karst formations known as the Pinnacles, deep gorges with crystal-clear rivers, and a unique mosaic of different habitats supporting a variety of life. It is such a unique place that Unesco declared it a World Heritage Site in 2005. 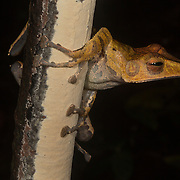 High in endemism, Gunung Mulu National Park provides significant natural habitat for a wide variety of plant and animal species, both above and below ground. 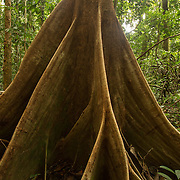 It contains 17 vegetation zones, exhibiting some 3,500 species of vascular plants. Its palm species are exceptionally rich, with 109 species in 20 genera recorded, making it one of the world’s richest sites for palm species. The large cave passages and chambers provide a major wildlife spectacle in terms of millions of cave swiftlets and bats. 27 species of bat have been recorded. 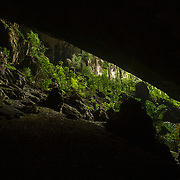 Deer cave in the southern limestone hills of the park, which is recognised as one of the largest, if not the largest single cave chamber in the world is home to an enormous colony of wrinkle-lipped bats (Tadaria plicata). The bats exit the cave in waves almost every evening in search of food like enormous shoals of fish undulating across the sky. The adventure caving there is excellent and provides different levels of difficulty, and each cave system is very unique in terms of the experience and its features. I’m not usually an “organised” trip person but I really enjoyed all of the day trips along the river, to the caves and gorges. There are boardwalks from the park headquarters into the surrounding forest, and I found the night walks into the forest to be very rewarding. I was particularly amazed at how many different species of stick insects (Phasmida) I encountered. A highlight of my trip to Borneo was undoubtedly the two weeks that I spent at Gunung Mulu National Park in Sarawak. The 529 sq km park is named after Gunung Mulu, a 2,376 m high limestone pinnacle, which overlooks a fascinating area full of natural wonders including cave systems of mind-boggling proportions, spectacular karst formations known as the Pinnacles, deep gorges with crystal-clear rivers, and a unique mosaic of different habitats supporting a variety of life. It is such a unique place that Unesco declared it a World Heritage Site in 2005. 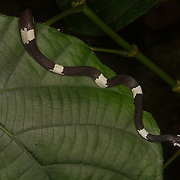 High in endemism, Gunung Mulu National Park provides significant natural habitat for a wide variety of plant and animal species, both above and below ground. It contains 17 vegetation zones, exhibiting some 3,500 species of vascular plants. Its palm species are exceptionally rich, with 109 species in 20 genera recorded, making it one of the world’s richest sites for palm species. The large cave passages and chambers provide a major wildlife spectacle in terms of millions of cave swiftlets and bats. 27 species of bat have been recorded. Deer cave in the southern limestone hills of the park, which is recognised as one of the largest, if not the largest single cave chamber in the world is home to an enormous colony of wrinkle-lipped bats (Tadaria plicata). The bats exit the cave in waves almost every evening in search of food like enormous shoals of fish undulating across the sky. The adventure caving there is excellent and provides different levels of difficulty, and each cave system is very unique in terms of the experience and its features. I’m not usually an “organised” trip person but I really enjoyed all of the day trips along the river, to the caves and gorges. There are boardwalks from the park headquarters into the surrounding forest, and I found the night walks into the forest to be very rewarding. I was particularly amazed at how many different species of stick insects (Phasmida) I encountered.